ISS Commander Kevin Ford shows off a Thanksgiving delicacy, space-style: marshmellow fluff and candied yams (Credits: NASA). The current commander of the International Space Station, Kevin Ford, is a US citizen and will be celebrating Thanksgiving on November 22 along with his compatriots back on the ground. Ford, along with his Russian colleagues Evgeny Tarelkin and Oleg Novitskiy who are happy to celebrate the holiday with him, have pooled their seasonal foods for a traditional Thanksgiving feast – or as traditional as space food can be! Here, the Expedition 34 crew wish the people of Earth a happy Thanksgiving and explain what they’ll be eating this holiday. 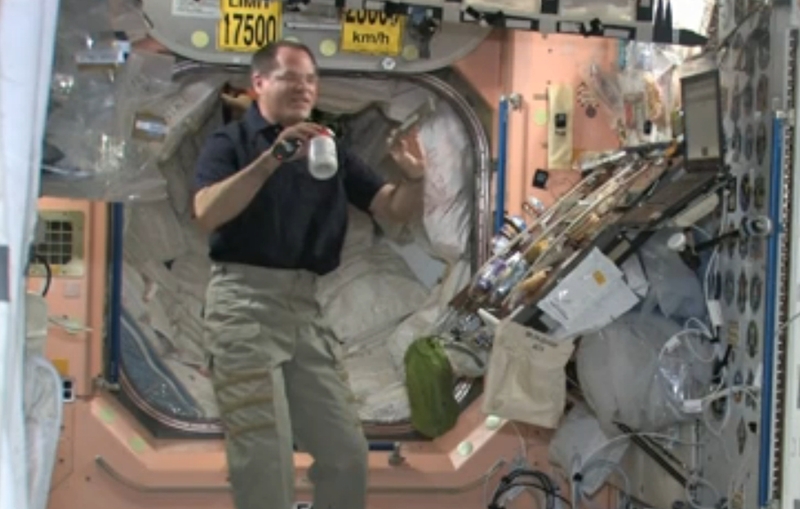 Wonder how space food gets put together? Check out this series from NASA food scientist Vickie Kloeris as she explains the origins of the feast the crew will be eating this Thanksgiving as well as the psychological impact of food during a long duration flight.